Costume Jewelry, Favors, Small Toys & More. Your little girl’s party is sure to be a hit with giveaway ideas and party favors from 1SuperParty! We offer a wide selection of theme party supplies, party favors, toys, trinkets, costume jewelry, and so much more. 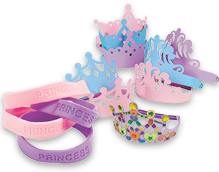 Whether she’s into fashion, fantasy, or just plain old fun, 1SuperParty has the perfect add-ons and accessories that your little girl and all of her friends will just love. Shop for girls party favors and supplies at 1SuperParty.